The natural cleaning attributes of soapwort together with the high concentration of herbal extracts will leave all your mirror and glass surfaces sparkling clean. This sparkle spray will help you breeze through the cleaning. The natural cleaning attributes of soapwort together with the high concentration of herbal extracts will leave all your mirror and glass surfaces sparkling clean. 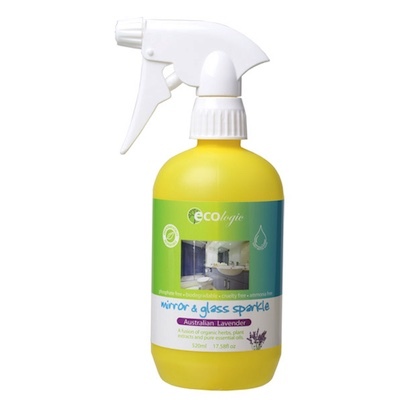 ECOlogic Mirror and Glass Sparkle cuts through grime, built up soap scum and oils leaving your shower screens, sparkly clean and streak free. Perfect to remove grease and spots from mirrors and glass surfaces leaving them shiny clean. Use it also to remove finger marks from around glass surfaces, mirrors and door handles. Your whole bathroom will be left clean and diffused with a fresh lavender aroma.